Here’s the perfect indulgence for those moments when you need a chocolate recipe that can be whipped up in mere minutes with staples from your pantry. 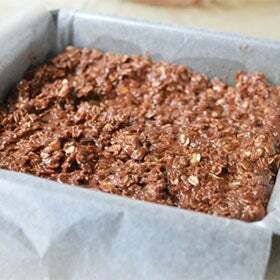 These no-bake oatmeal chocolate cookie bars only require 6 basic ingredients and a few minutes of assembly time, so fewer than 20 minutes after a craving strikes or the need for a quick and easy dessert pops up, you can have bars that taste like oatmeal studded chocolate fudge ready and plated. 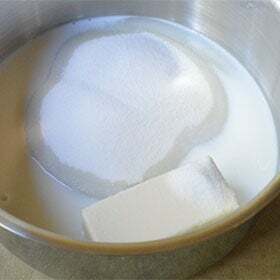 In a medium sized saucepan, melt the butter, milk, and sugar together. Bring to a boil for one minute. 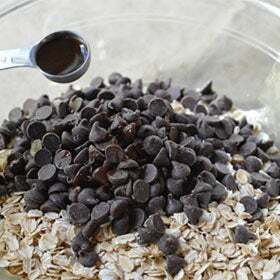 Meanwhile, in a large bowl, mix chocolate chips, oatmeal, and vanilla extract. 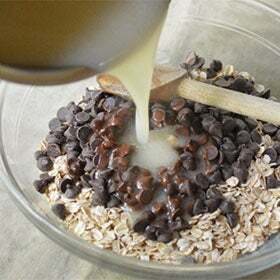 Pour hot mixture over the oatmeal and chocolate. 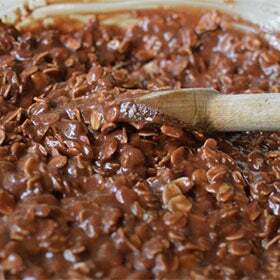 Stir until chocolate is melted and ingredients are well combined. Remove from pan, slice, and enjoy! 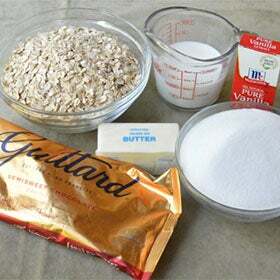 *Use gluten free oats to make this recipe gluten free!